More often than not, I look for games that provide me a thematic experience, with a rich story and setting and the ability to interact with both. However, there are also times when all I want is to play something abstract and strategic. Some of my earliest gaming memories are of playing Uno with friends and family. There’s an elegance and simplicity there that sometimes I yearn for. 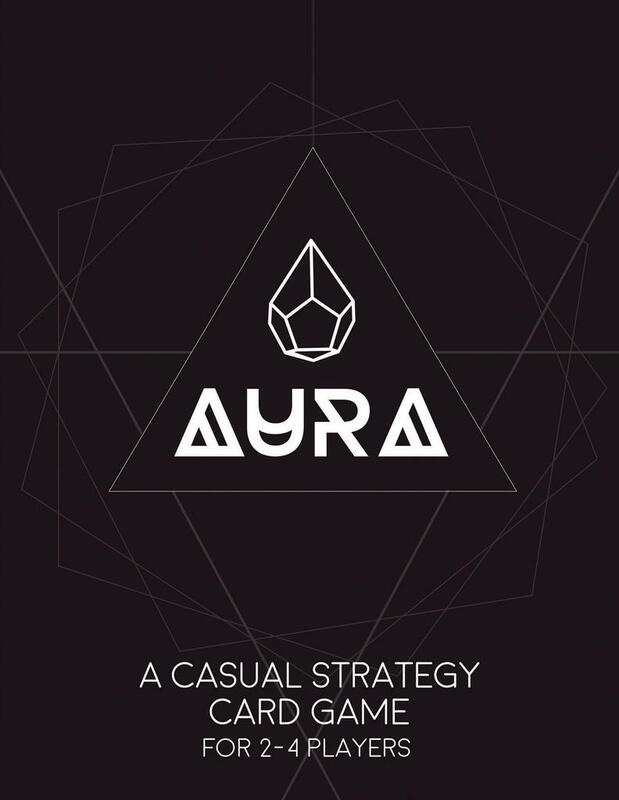 To meet that want, I was interested in trying out Aura by Michael Orion and WhoaWorthy Games, a newcomer to the card game scene. Are Aura’s colors vibrant and vivid, or do they take on a dull and muted pallor? Read on to find out! 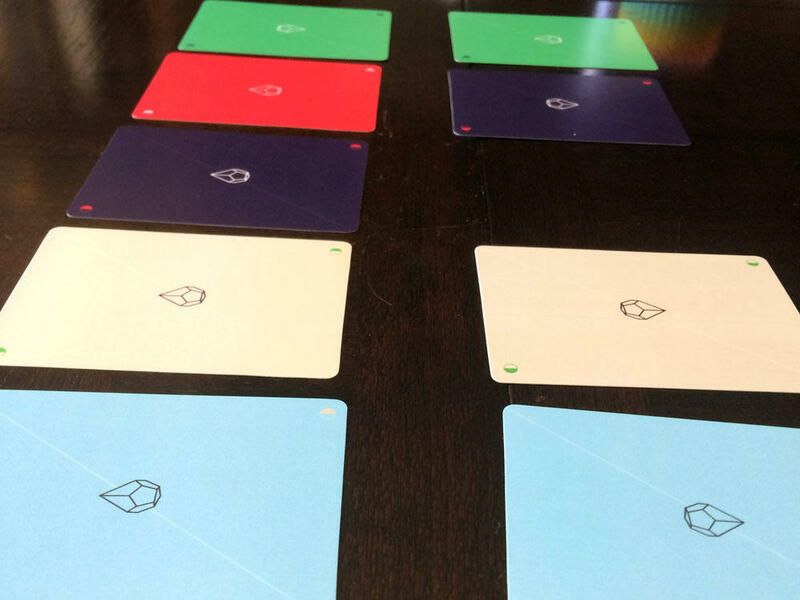 Aura is an abstract strategy card game for 2-4 players, that plays in about 30 minutes. Aura plays well with any number of players. 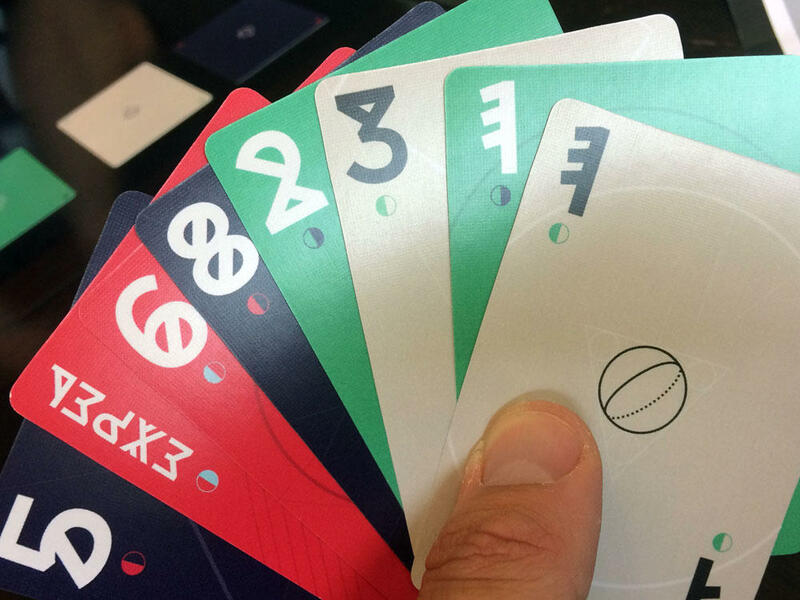 In Aura, each player receives a 50 card deck that represents their Aura, their life force and energies, with five different colors comprising it. Players take turns playing cards, attacking and defending attacks, hoping to deplete their opponents’ aura while at the same time maintaining their own. Through comparison of card colors and values, the results of card conflicts are determined. When one player runs out of cards in their deck, the game ends, and the player with the most cards remaining in play is declared the winner. Your opponent can always see what colors you are holding, providing Aura with some deeper strategy. The Aura deck is the driver of the game, with each player getting an identical set of 50 cards. There are ten cards of each color, cards numbered 1-8, a Wild card and an Action card that provides each color with a special power that can dramatically shift the game. Action cards are also considered to be the highest value card of its color, which is important during gameplay. 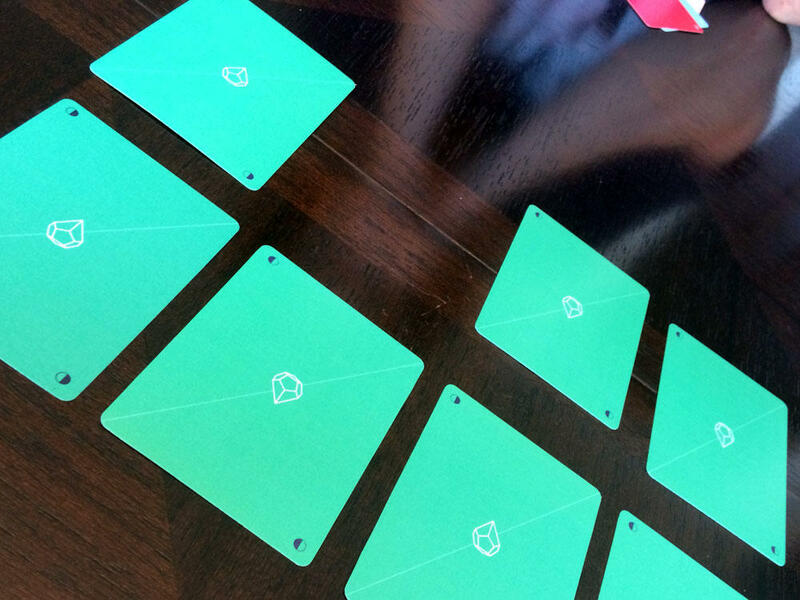 Each player draws a starting hand of 8 cards. 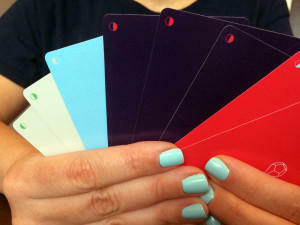 The card backs are colored, so that every player knows the color of their opponents’ cards, but the values remain hidden information. One player is designated as the active player, and they play between two and five cards from their hand to attack their opponent and deplete their aura. 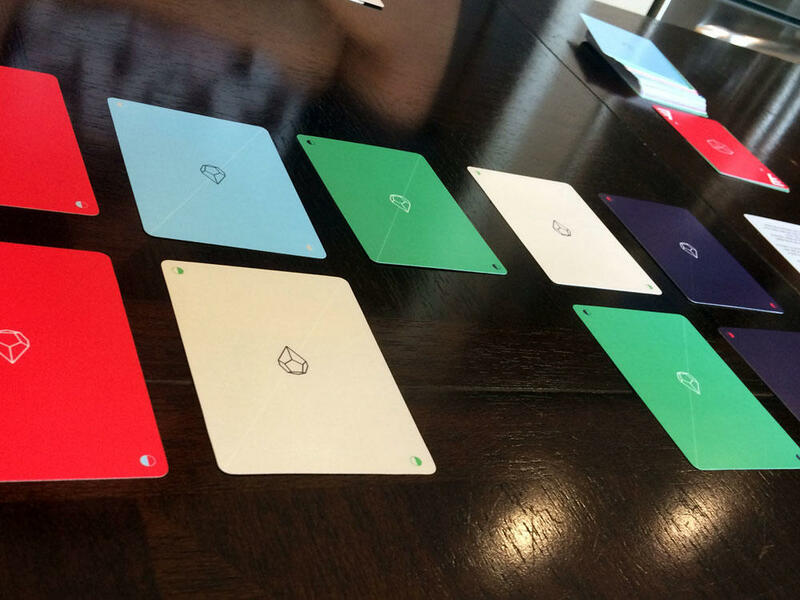 These cards can be deployed in one of two ways, either with all cards of the same color, or all cards of differing colors. Cards should be chosen to maximize the number of unblocked cards, based on the colors your opponent is holding. Defending players are then given the option of potentially blocking cards, shielding a player from the attack. To block a card, a player needs to either block with an opposing color card of any value (i.e. red opposes indigo, so an indigo 1 will block a red 8) or with the same color card with a higher value (i.e. a green 6 blocks a green 5). All attacking and blocking cards are played face-down. At this point, all cards are revealed and potential blocks are resolved. Special powers are activated when cards are revealed, causing their effects to take place during that round. The defending players are then forced to discard cards equal to the number of unblocked cards that got through their defenses, either from their hand, deck or cards in play. All remaining cards go to each player’s reserve pile, which is kept separate from the discards. Players then draw up to five cards, to form a maximum of 8 turns and then the active player designation rotates to the next player. Play continues, with active players attacking and all other players defending, until one person runs out of cards in their deck, at which point play continues until all players have one final turn. Players count up the cards in their main deck and reserve pile, and the player with the most cards remaining is declared the winner. In truth, we did not quite know what to make of Aura at first. It’s theme-less and abstract, with a straightforward yet complex set of rules. We did not quite grasp the game until halfway through our first play through, at which point you could see the light bulbs go on over our heads. All at once, the strategy, the mechanics and everything clicked, and we went from sort-of having a good time to really enjoying ourselves playing Aura. Is it better to play the high cards, or try to sneak both of the low 1 card through on a bluff? There are lots of choices to be made in order to be victorious. Since all players are involved in every turn, either as the attacker or one of the defenders, there is no downtime in Aura, which leads to much more engaging gameplay. In fact, it makes playing the game with 4 players a relatively easy feat, since you do not have to wait a full cycle of turns for your spot to come up in the play order. There’s an all-green battle going on. Hopefully the defenders have higher values than the attackers. If there is one drawback that we found to Aura, it’s how the game handles laying out the cards for attacking and defending. The rules suggest laying the cards out in a grid, but we found that this became a bit confusing during both resolution of blockers and collecting cards for reserve and discard piles. Instead, we found laying out the defending cards to correspond to the attacking cards in particular position (1-5, from left to right). It was a bit of house-ruling, but we found it to be a better solution. In that same vein, we actually played Aura with alternate rules for ending first, recycling and reshuffling our reserve decks until one player had 25 cards discarded. Even though this is not the primary end condition, we found it to be more enjoyable and having more strategy than the standard end condition of deck depletion. In upcoming plays of Aura, we will only be using the variant endgame rules. It’s a rainbow attack, with one Aura card of each color trying to get through. 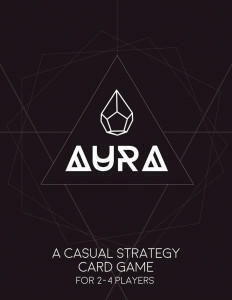 Aura describes itself as a “casual strategy card game” and I see no need to reinvent the wheel here. This game gives a solid amount of strategy and depth with a game that is unique in concept and superb in implementation. It plays great with any number of players, due to the lack of downtime and constant engagement of all players on every turn. Aura is a game that should find a happy home in the collection of any gamer who enjoys abstract strategy in a card game, in a nice, neat and swift package. Aura is not currently for sale, but is currently in production. Look for Aura this winter or possibly in Q1 of 2016.